Diana Damian lectures in Performance Arts at Royal Central School of Speech and Drama. She is a writer and cultural commentator, and taught at several other universities in the UK, Norway, Portugal, and at NYU Tisch School of Arts. She has worked The Live Art Development Agency, Spill Festival of Performance, LIMF and the Victoria and Albert Museum. Lyn Gardner is Associate Editor of The Stage, writes for Stagedoor, teaches on the MA in Dramatic Writing at Drama Centre London, Central Saint Martins, and is the published author of a series of children’s novels. She was a founding member of City Limits magazine and contributed to The Independent before becoming a theatre critic for The Guardian for 23 years until 2018. Martin Hargreaves is Director of Undergraduate Programmes at London Contemporary Dance School. He is a dramaturg, writer and performer, has lectured in Fine Art and Performative Practice and from 2003 to 2013 was editor of Dance Theatre Journal. His primary academic interests are in the recent history of contemporary dance, queer performance arts, and camp misunderstandings. Simon Hart is Artistic Director and CEO of Puppet Animation Scotland. Trained as a classical singer at RCM and actor at Bristol Old Vic Theatre School, he had a successful career in rep, opera, and on TV before turning to arts management. He is the artistic director and chief executive of two annual festivals in Edinburgh, Manipulate Visual Theatre Festival and Puppet Animation Festival. 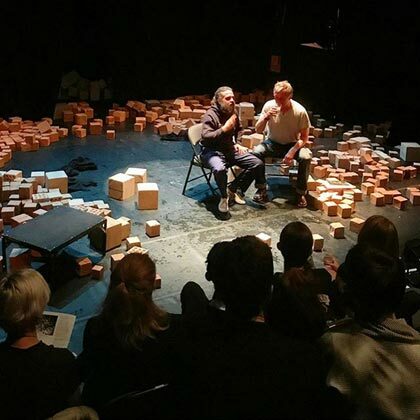 Donald Hutera is a freelance journalist and curator, writing and speaking about dance, theatre, live performance and the arts in the US and UK since 1977. Publications and websites include The Times, Dance Europe and londondance.com. He co-authored The Dance Handbook and edited The Rough Guide to Choreography. Curating and producing include GOlive Dance and Performance Festival. Tarek Iskander is the Interim Director of Theatre at Arts Council England and the new Artistic Director/Chief Executive of Battersea Arts Centre. Sacha Lee is Artistic Director of The Point and Berry Theatres in Eastleigh, Hampshire. Trained as a contemporary dancer and choreographer, she was a founding member of Random Dance and co-founded Retina Dance Company in the mid 90s. The Point has a strong history of supporting artists and enabling a step change to artists working in dance, theatre, circus and aerial performance making. Sacha is trained in the Liz Lerman’s Critical Response Method and is an accredited coach. Guillaume Pigé is a performer, director and teacher. In 2009 he founded mime and physical theatre company, Theatre Ré. He teaches at RADA and at Fourth Monkey and gives workshops in the UK and abroad. He is an Associate Artist at The Point Eastleigh and South Hill Park Arts Centre and a Supported Artist at The Greenwich Theatre. Kate White is Chief Executive of the National Centre for Circus Arts. She was previously Director of Marketing and Communications, then Deputy Chief Executive when NCCA was known as Circus Space. Since its relaunch in 2014 NCCA has gained government support together with that of the sector, to formalise its leadership role in positioning circus alongside other art forms as an important part of the UK’s cultural offer. Thomas Wilson is a writer and Module Co-ordinator BA (Hons) European Theatre Arts. Originally trained in equestrian gymnastics he competed at national and European level in the 1990s. He then pursued his interest in performance, in particular work at the intersection of dance and theatre. Publications include Total Theatre magazine, writing predominantly on contemporary circus and dance. He recently published a history of Gandini Juggling, Juggling Trajectories. Sarah Wright is a puppeteer and director of puppetry. She is Associate Artist with Kneehigh and Little Angel Theatre and her performing and directing credits include with Matthew Bourne, Young Vic, RSC, Improbable and Faulty Optic/Invisible Thread. She recently founded The Curious School of Puppetry, an annual intensive training programme for people with an interest in operating and producing work with puppets.